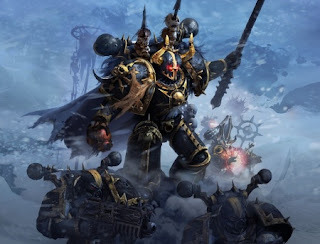 I'm starting this escalating narrative campaign at the beginning of November and I'm going to use it to get my Chaos marines finished for the new year. The campaign is turn based and takes place on a planetary empires map. you have your home base of course, but there are some special tiles that can grant you either an extra Fast Attack, or Heavy Support, or whatever. I'm likely not going to stray outside of the standard force org too much, but the initial org chart your given is VERY limiting. The campaign starts out a 1000pts so I am trying to get my initial list finalized and painted for the first turn. My shooting in this list is a little lackluster, but on 4x4 boards there isn't a place one could really run to get away from Uncle Gespacho, the daemon prince, and his band of merry spawn. I just need something to open up any transports to expose the gooey nougat inside, hence the forgefiend. Cultists are there for moral support.